Yesterday was Mom's birthday, so I put up the Christmas tree. I'll probably add to it this month. There are some new pieces already this year, as well as some missing ones that I've given away since last year. That's how it always goes. In keeping with the theme of things going the same way as usual, I just received confirmation that a package I mailed arrived. Yeah, I boxed up and addressed that knitted Thanksgiving meal and it went on our North Carolina adventure and I didn't get it out in the post until this week. I'm terrible and I know it. Anyway, I'm told it will make it's next journey to the hospital tomorrow. 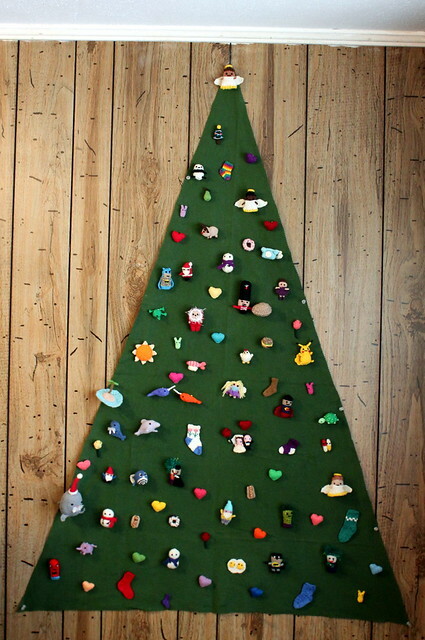 I think I'll knit a Christmas tree next and maybe I'll even get it there in time. I won't box it up the same way as the last package, so that should help.